A fresh batch of PTI stamps and inks arrived just in time so that I could participate in the Papertrey Ink January blog hop. This month instead of the usual photo inspiration, the challenge was to pick a favorite project from 2011. I don't have a ton of cards to choose from last year, but looking back at past projects, there was a definite theme running through 2011. For me, 2011 was year of the rosette (see this card and this card and this card, no need to continue;). Something about that shape really appeals to me and they hold a special place in my papercrafting heart. I started off by making the rosette from a stamped strip of flowers from the new Mat Stack 5 set. I decided to fussy cut around the flowers so that the finished rosette would have petals. 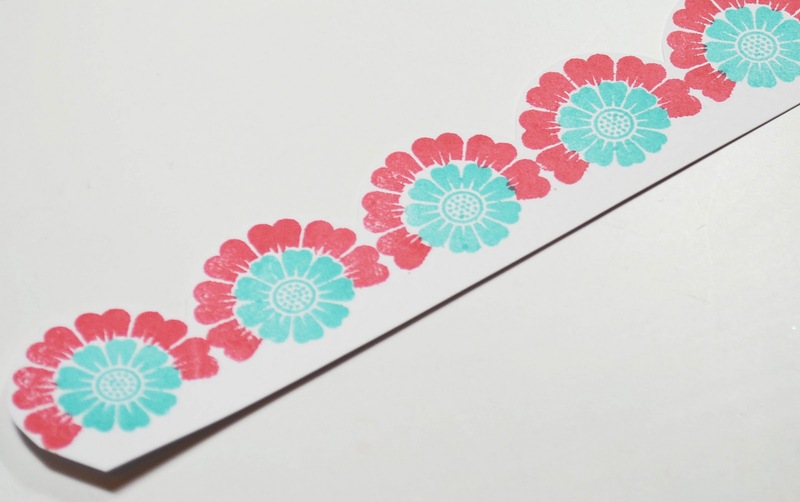 Tip: stamp one more flower than the number of petals you want. This will give you enough to overlap your seam. The background "frame" is stamped using more stamps from Mat Stack 5 and Giga Guide Lines. The Mega Mat Stack 5 die was used to create the inside of the frame. This is my first mega die, and I can see it being used all kinds of ways! I finished off with a sentiment embossed in white and the rosette popped up inside the frame. I used my new Berry Sorbet and Hawaiian Shores ink and it's so nice to get a good color match to my cardstock. That's it for me today! I can't wait to see what everyone else is posting for the the blog hop. Thanks so much for visiting! You are the Queen of Rosettes this year and I love your stamped background! Love all your rosettes and this card is awesome. That flower is the bomb! Wow! That is so cool! Love how you created that focal point flower! So creative! Love your use of stamps in your rosettes. This is amazing! Can't wait to try this technique! This is absolutely gorgeous. I am pinning so I can make one myself. I hope it's not too hard to figure out. Your cased card is gorgeous. Love the colors. That rosette is amazing. Need to try it. I love the new mega mat stack 5. try using it as a card base. JJ that rosette is awesome - love your color combination too! You make it look too easy! Very ingenious design. Thanks for the instructions, because I would never have figured out how you did that!! WOW! I love that you made your own rosette strip! Wonderful stamping and a great color combo! Great card and wonderful use of your tools! Love the colours you've used and the clean lines! The rosette is just fabulous! I don't even understand how you come UP with these rosettes, JJ??!!!! This card is beautiful, sooo beautiful! Love the colors and the striking design with the Mat Stack frame around the outside...WOW! Absolutely gorgeous! What an inventive idea! Love it! Very beautiful rosette! You're a master at it . Lovely card in all. This card is beautiful and so creative - love everything about it. Perfect color choices! The rosette is fabulous, I will have to try it myself. 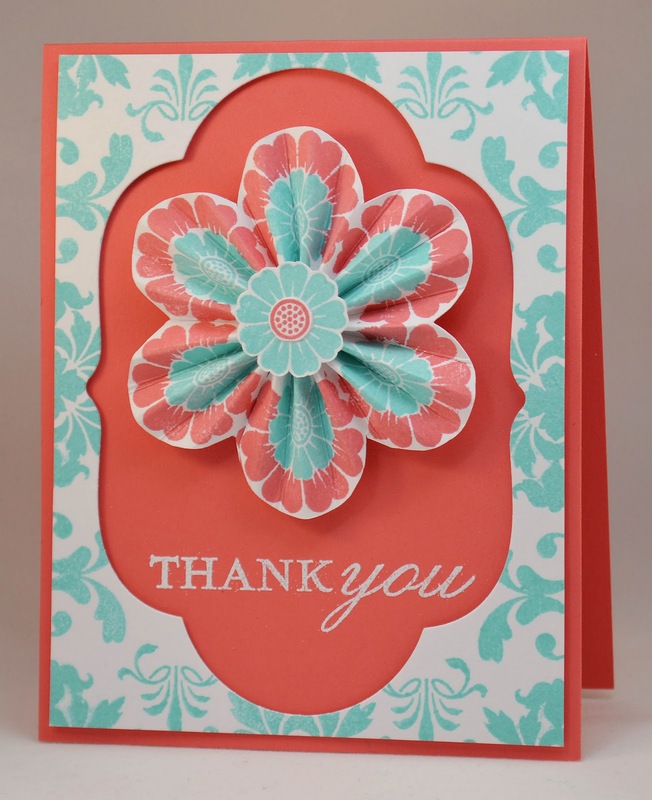 love your outside of the box thinking here with the stamped rosette, gorgeous color combo too! Beyond gorgeous! Love all the stamping you did. amazing card. love the medallion and smart stamping. Wow- I love the colours and the fact that you've made everything yourself. Gr8 card. thats so cool!! so clever and beautiful!! Holy wow! That flower of yours is so beautiful and dramatic. I love how you used the mega die to create your frame. It really follows the shape of the flower wonderfully. Thank you so much for sharing! Ha ha, the above poster's comment caught my eye, and "Holy wow" is right! 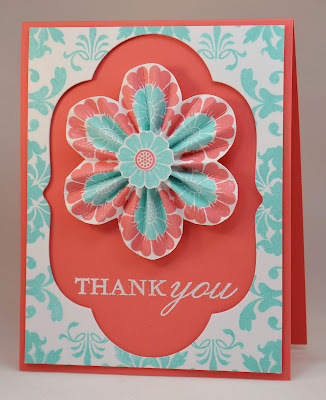 I LOVE LOVE LOVE your stamped rosette, and I'm definitely going to give that a try! Your card is just amazing! I love colors and that flower you made is just so beautiful! JJ--I went back and looked at your 2011 cards, your rosettes are just amazing! 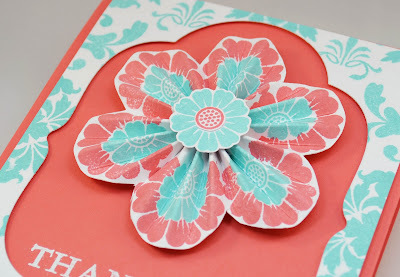 This card is so pretty, I just love the colors and of course the rosette! Wow! This is just stupendous! I love the colors and the darling rosette. So innovative. Again, wow! This is soooo pretty! Oh, now I'm so sorry I didn't put this set in my basket, ha ha! I love the colors you chose for your card, very fresh design, so beautiful!! !